Last Saturday I decided to head back to the Pike Lake Unit of the Kettle Moraines. I got a lot of good photos last time, but this time I wanted to try a different lens. All the photos from this hike were shot with the Canon 18-55mm kit lens. It was nice to have something a little wider than my 28-135mm, but I did miss its image stabilization and sharpness. This entry was posted in General, Nature, Photos and tagged landscape, macro, Nature, photography, Photos, pike lake, wisconsin on August 23, 2008 by Scott. Senator Obama’s proposed “tax cuts for the middle class” are actually marginal rate hikes in disguise. It’s pretty simple. 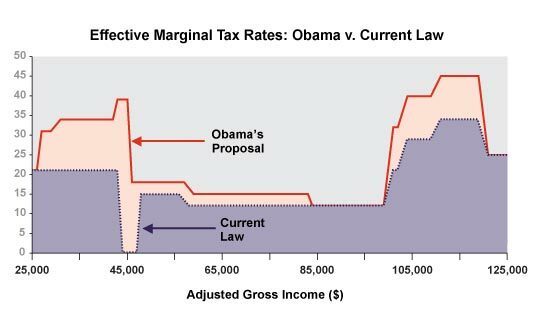 If you have an adjusted gross income of between $85,000 and $100,000 or so, Obama won’t raise your marginal tax rates. If you’re anywhere else in the income scale, you’re not so lucky. Although Obama is offering a new series of tax breaks, they undermine rather than improve economic incentives. First, whether or not you get those breaks will depend on your income. In Washington, taking away tax breaks as families work harder to make more money is called a “phase-out.” Economists have a different name for it—we call it a tax. Reducing a person’s tax credit as his income goes up also reduces his incentive to earn more income. This entry was posted in General, Photos, Politics, Science and tagged McCain, obama, Politics, taxes on August 13, 2008 by Scott. Photos from my hike on the blue trail at Pike Lake State Park in the Kettle Moraine State Forest of Wisconsin. The weather was perfect. Unfortunately, the bug spray I brought didn’t stop the flies from “attacking” my head throughout the hike. I’m definitely going to wear a hat next time. Three of the photos were handheld HDR. This entry was posted in General, Nature, Photos and tagged hdr, kettle moraine, Nature, Photos, pike lake state park on August 3, 2008 by Scott. The International Cycling Classic is a series of bike races throughout the Midwest in the month of July. Some of the best riders not in the Tour de France come here to race. The Point Premium Root Beer International Cycling Classic presented by Time Warner Cable is the world’s largest multi-category cycling event. The 40th annual event will take place from July 11 – 27, 2008. The highlight events of each day’s racing will be the men’s and women’s Superweek Pro Tour races, featuring top professional and elite amateur cyclists and teams from across the U.S. and more than 20 foreign countries. The 2008 event series will feature races in twelve city centers throughout Eastern Wisconsin and Northern Illinois, including many locations throughout the Greater Milwaukee area. Nowhere else in America can cycling fans see 17 consecutive days of the highest-caliber bicycle racing. What Wisconsin and Illinois will witness again this July is the fusion of the best athletes in the world and today’s high-tech bicycles in an explosion of speed, power and excitement. Join us to see why bicycle racing is one of the world’s great summertime spectator sports. Come and see why the International Cycling Classic is known throughout the world as Superweek! This entry was posted in General, Photos, Sports and tagged bike racing, Photos, super week on July 27, 2008 by Scott. This entry was posted in General, Photos and tagged Photos, smugmug, watermark on June 2, 2008 by Scott. My brother just graduated from the University of Wisconsin – Madison. Congratulations, Ross! Below are some pictures. Click the link to see the entire gallery: Ross’ Graduation Photos. Click the photos below to see the largest size that your browser window allows. This entry was posted in Family, General, Photos and tagged Family, graduation, Photos on May 18, 2008 by Scott. On my recent trip to Prague, I used the auto-bracketing feature of my digital SLR to take a series of three photos that I later stitched together using Photomatix to form the final tone mapped HDR image. The collection of my tone mapped HDR photos starts here. You can make the photos have a very natural appearance to an almost cartoonish appearance. I have tried to keep my photos on the natural side, but a few are on the border. Basically with this post I just want to give a few examples to show how much more detail is available when HDR photos are made. These were all handheld and would have improved with the use of a tripod. Click the small photos below to enlarge them. This entry was posted in Interesting, Photos and tagged hdr, hdrsoft, Photos, prague, tone mapping on March 26, 2008 by Scott. I’ll be heading home early from studying to snap a few pictures of tonight’s total lunar eclipse. I guess it will be the last one seen in North America until December 2010. Unfortunately, I forgot my tripod at home so I’ll have to do it hand held. Expected temperature (without wind chill) for the eclipse in Southeast WI is supposed to be a balmy 3 degrees F. I’ll update this post with the photos once my camera warms back up from the cold. EDIT: As promised, here is a photo of tonight’s eclipse. These photos were hand held and taken with a good lens but not great lens (Canon 28-135 f3.5-5.6 EF IS USM). Click the photo to be taken to the gallery. This entry was posted in Photos, Science and tagged eclipse, moon, photo on February 20, 2008 by Scott. My home town is very close to the Northern Kettles, but since I’m now going to school in Wauwatosa/Milwaukee I’m very close to the Southern Kettles. This past Saturday was really nice and a couple days prior I decided that I was going to wake up early (7:20am on a Saturday for me) and go for a hike with my dSLR. I did manage to wake myself up that early and had a great time hiking the Scuppernong hiking trails. This entry was posted in Nature, Photos on October 14, 2007 by Scott. I was able to head home this past weekend for a great weekend of biking (Clover Leaf Century) and some sailing. My parents just got a Flying Scot. It is a small 19-footer but is significantly bigger than the Lasers we’re used to sailing. It is a good sized boat for inland lake sailing or even for Lake Michigan in not too bad conditions. We really lucked out on the weather this weekend. Last year it was in the 40s for the bike ride and we didn’t even think twice about going sailing. However, it was perfect this year: in the mid-80’s for the bike ride and pretty much the same for the sailing. Please click the photo below to visit my Flying Scot Smugmug gallery. This entry was posted in Family, Photos, Sports on October 9, 2007 by Scott.